Do you worry about being found out as a fraud? Are you convinced that luck is the only reason you have your job? Has you inner critic been so loud you can’t hear yourself think? Have you felt inadequate when comparing yourself to your colleagues? 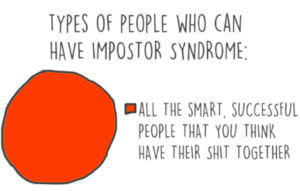 Unfortunately, feeling like this is common and it now has it’s own label; ‘imposter syndrome’. Psychotherapists researching high achieving woman coined the phrase as a shorthand when, despite outstanding academic and professional accomplishments, they found women persisted in ‘believing that are really not bright enough and have fooled anyone who thought otherwise’. Understanding the syndrome helped me to recognise it in myself when my inner-critic voice was trying to convince me I should give up trying and go home. It reared its head when I was promoted to a new job in an unfamiliar area, and also when starting my own business. Through coaching, I understood that conscious incompetence triggers my imposter syndrome, for example when I have to try to do things for the first time that I don´t know how to do. This personal insight makes it easier for me to support my own coaching clients when they are brave enough to admit to this debilitating experience. The first thing to appreciate about the imposter syndrome is that it’s not logical, rational or based on data. So simply dismissing it or telling yourself ‘you will be fine’ simply doesn’t help. The first thing that helps is admitting to yourself that it’s happening and telling someone who can support you. Being prepared to talk about the feelings, your fears and what’s happening can be a relief in itself. There are lots of ways that you can start to reduce both the feelings of inadequacy and also the critical voice in our head that often accompanies it. We have to remember that we are often have unconscious drivers and by raising awareness we can start to take back control. One of these is by revisiting times and scenarios when we have felt confident and becoming connected to these experiences. These can help remind us both of what we are good at and also how it actually feels when we are confident. By paying attention to where that feeling is in our body, and the sensations that come with it, we can recreate it for ourselves rather than assuming we have to wait for it to arise. Sometimes our internal critic has got out of hand, because we haven’t developed our ability to notice what has gone well. Just like going to the gym, this is a muscle we can build. We can do this by noticing and recording what you appreciate or you are grateful for. Rhonda Byrne offers multiple practices for building this muscle, including reflecting before going to sleep each night on the things you can be grateful for that day and saying ‘Thank you’. Often our imposter syndrome is being fed by our imagination. A good starting point in combatting our inner demons is to ask people what they value about working with you, or what they see as your greatest strength. Listening to what others appreciate in us can help with building our self-confidence. You will notice these questions are deliberately appreciative because when experiencing imposter syndrome, we don’t need any help knowing what we need to do better! Whilst these might sound like simple and small steps, these practices can help dial down our imposter syndrome. If you would like to talk about imposter syndrome or get some more ideas drop us a line.